Measuring approximately 900m in length, the bay is sandy, backed by an extensive dune system, with limestone cliffs on either side. Situated on the south west coast of Anglesey, the bay is considered to be fairly remote, due to its 1 kilometre proximity from the nearest road way. The dune system is protected and listed as a Special Area of Conservation, with the beach area making up part of the Tywyn to Aberffraw Site of Special Scientific Interest, confirming the high conservation status of the Area. The site also lies within the Anglesey Area of Outstanding Natural Beauty. The water quality sample point lies at the north end of the beach, 150 metres south of the cliffs. There is one intermittent discharge in this catchment. Aberffraw Sewage Pumping Station discharges directly into the Ffraw upstream of the bathing water. A project known as Event Duration Monitoring (EDM) is underway to install telemetry on Combined Sewer Overflows (CSOs) within 2km of a bathing water by 2020 so that Dŵr Cymru Welsh Water (DCWW) know when the CSOs are operating and can work to reduce spills. Two CSOs near Aberffraw are included in the project. Natural Resources Wales continues to work to establish sources of pollution around Aberffraw. Some of this work is carried out in partnership with Anglesey Council and Dŵr Cymru Welsh Water. Inspections are carried out by Natural Resources Wales in partnership with the local authority and the water company. These are carried out pre-season (before the 1st of May) and mid season if required (during the bathing water season). 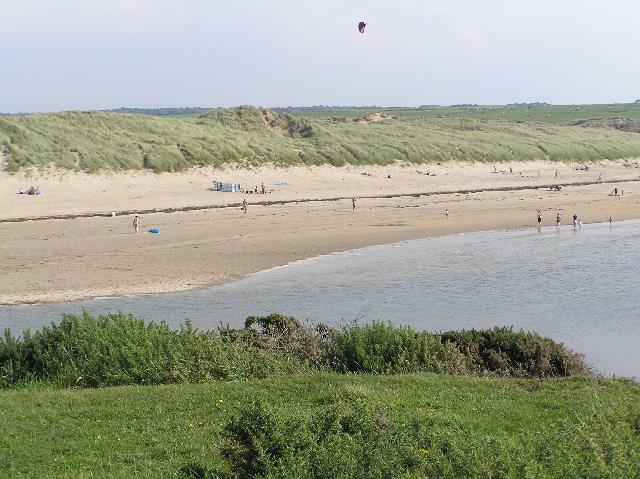 Natural Resources Wales continues to work with Anglesey Council to maintain the high standard of water quality at Aberffraw. Streams are typically affected by sewage or industrial run off from further up the catchment. The Afon Ffraw is the main river in the catchment. In terms of volume, the Ffraw is a relatively small water body. However, it does drain a large and intensively farmed area of western Anglesey and also flows through Llyn Coron. There is no evidence at present that the quality of the Ffraw represents a risk to bathing water quality. Aberffraw Sewage Treatment Works discharges secondary-treated sewage into Aberffraw Bay. There is also a consented discharge of settled storm sewage within the catchment that discharges into the Bay. Gwalchmai Sewage Treatment Works discharges to the river quite far upstream. Natural Resources Wales samplers make visual observations of the beach at every visit. This includes assessments of sewage debris, animal faeces, litter and oil or tar. At Aberffraw, data are available for the four year assessment period from 2011-2014. Sewage debris was observed in trace amounts on less than ten per cent of occasions. Animal faeces was noted in trace amounts on a minority of occasions and in greater amounts on one occasion in June 2013. Trace amounts of litter were observed at the bathing water the majority of the time and in greater amounts on less than ten per cent of additional occasions. Oil and tarry residues were not noted at this site. Intensive agriculture dominates the catchment. However, there are currently no known issues with the farms in this catchment that could adversely affect the current bathing water quality. Llyn Coron and the land area upstream lie within the designated Nitrate Vulnerable Zone. Up river from Aberffraw lie a number of isolated dwellings with private sewage treatment facilities. Natural Resources Wales does not believe these are a source of pollution to the bathing water at present. If any concerns arise, investigations will be carried out and the responsible party will be required to carry out immediate remedial action. Poorly maintained private sewage treatment facilities could be a source of pollution, therefore the registration of all private sewage systems in Wales is required by 30 June 2012. The primary aim of this exercise is to provide increased protection for the environment and sensitive features such as bathing water beaches. Where properties are identified in the catchment that are not on mains sewerage, Natural Resources Wales will endeavour to ensure registration has been made. The natural drainage (hydrological) catchment surrounding the bathing water is primarily rural. The village of Aberffraw sits at the lower end of the catchment, with the rest of the area dominated by agricultural land and isolated dwellings. The River Ffraw and River Gwna drain the catchment for approximately 8 kilometres, meeting the sea at Aberffraw.